The Nikon SB-5000 is a top of the line speedlight for Nikon digital SLRs and film SLRs. It uses i-TTL for exposure control and can be used off-camera singly or in groups of multiple flashes. While it is compatible on camera with most of Nikon’s current offerings, it is truly at home on professional level DSLRs and the new mirrorless Z7. At a cost of around $600, it’s probably not likely to find a home on most of the consumer-level Nikons, but it does work with them. The cameras that can take full advantage of all of the features of the SB-5000 are the D5 and D850 full frame cameras, the D500 and D7500 APS-C format cameras, and the Z7 and Z6 mirrorless full frame cameras. The feature of this flash that these models can access is the new radio wireless remote function. In order to use the radio wireless function, the compatible cameras employ a wireless adapter attached to the camera’s remote port, unlike the optical wireless which fits on the camera’s hot shoe. Radio wireless also differs from Nikon’s optical wireless in that it does not require line of sight for the flash to be triggered. This opens up many solutions for difficult lighting situations. 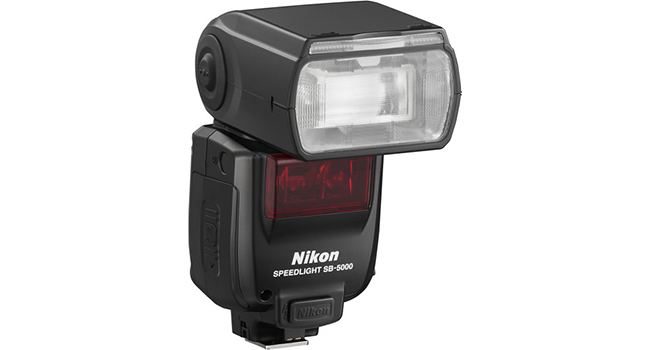 The SB-5000 is able to be used as a master or slave flash to other Nikon flashes by means of optical control. It can also be triggered with both optical and radio for a large group of remote flash units. When using radio wireless, the SB-5000 is a slave flash only. It can be a master controller or a slave flash optically. Optical slave functions can come from the built-in flash of compatible cameras, another Nikon speedlight with the feature, or through the SU-800 speedlight controller. Through the lens, metering control is maintained with compatible cameras and the SB-5000 flash. Multiple flash units all work together to provide correctly metered exposure. The maximum range of the radio wireless is nearly 100 feet. Radio wireless is the biggest differentiator between this flash unit and previous Nikon speedlights. That said, this speedlight has all the advanced features and capabilities we have all come to expect from the top of the line Nikon flash units. Nikon strobes have always had incredible performance for their size, and the SB-5000 continues that tradition. One common issue when shooting with smaller, camera-mounted flashes is heat build up. Excess heat can cause circuits to fail and damage the flash. A speedlight can get very hot with rapid fire full power flashes and recharging. Nikon addressed this problem with special construction that manages heat very well. Advanced circuitry operates at a lower heat level in the first place. A built-in cooling system and a heat-shedding design enable up to 100 or more full power consecutive flashes before thermal cut-off circuitry protects the speedlight. This is great news for wedding photographers and event photographers who are often working in challenging light. Even in i-TTL mode, firing the flash may cause an almost full discharge. When the event won’t wait for the photographer, pros want equipment that can keep up with the action. Combined with professional cameras and Nikon’s best lenses, the SB-5000 completes an extremely capable package. Bounce flash can be employed with the camera in either landscape or portrait orientation. Tilt angles range from negative seven degrees (useful for close focusing applications), to 90 degrees. Swivel goes all the way back around to 180 degrees. Combining bounce and swivel together opens up opportunities to use light modifiers like small umbrellas and reflectors. Since i-TTL can remain enabled regardless of head orientation, exposure calculations are as simple as you want. Speaking of exposure calculations, the automation can be adjusted up or down by three stops. Manual control is also available. In manual mode, incremental power settings can result in ultra-short flash bursts for extreme action stopping effects. A flash duration of only 1/30,000th of a second is seen at the lowest 1/256 manual power level. Flash coverage is automatically set for FX and DX formats. The SB-5000 light output can cover the angle of view of a 24mm lens (FX format) all the way up to 200mm. Add on the optional wide diffuser and it can fill the angle of view of a 14mm lens in full frame. That’s a lot of built-in zoom. An AF illuminator aids the camera autofocus in lower light levels. There is also a low power modeling lamp on the front of the flash. Power normally comes from 4 AA batteries, either standard alkaline or rechargeable Ni-MH. From 150 to 200 full power flashes available per charge with recycle times as low as just under two seconds up to about 30 seconds with full discharge and draining batteries. SB-5000 is compatible with optional power supplies. Though it’s a smaller flash unit than previous top-end Nikon speedlights, the display and controls are actually easier to see and access. Frequently changed options have their own buttons or switches, while other options are pulled up from a full and deep menu. Camera menu options can control the flash, too. One of the advantages of the radio remote control is that flash functions can be set, changed, and adjusted from the menu of the controlling camera. The only caveat in regards to the radio wireless function is that it can sometimes be a little difficult to set up initially and somewhat temperamental in use. Firmware updates are likely to address some of those issues. This an easy flash to use and like. It is heavier than Nikon’s other current speedlights at right about one pound, but the weight is a trade-off for all the added capability and power. On the larger, professional level cameras, both full frame (FX) and APS-C format (DX), it balances nicely. Sturdy and well made, it can handle rougher use, within reason. The SB-5000 is really powerful for its size. The manual guide number (GN) is 34.5 m/113 ft (at 35 mm), 55 m/180 ft (at 200 mm) calculated in FX format, standard illumination pattern at ISO 100. Speaking of size, it is a tad bit smaller than the previous top-end speedlight from Nikon, the SB-910. 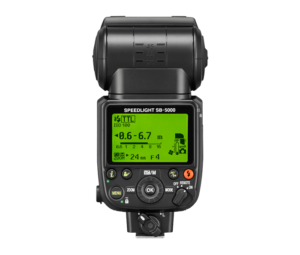 The drawbacks to this new speedlight are its high price and the difficulties noted above concerning the radio wireless remote feature. For anyone using the newest Nikon professional and prosumer DSLRs or the new mirrorless Z cameras, this speedlight is a good fit. It has features that allow it to cover almost any situation a serious photographer can find themselves in. The heat management and full integration with camera and lens functions, auto or manual, bring this flash to the top of the heap of Nikon speedlights.